Go Outdoors was founded over 40 years ago. In this time it has grown to become one of the leading outdoor clothing companies in the world. Go Outdoors works with only the top outdoor brands to ensure customers only receive the best product. Popular brands include Berghaus, Craghoppers and Hi-Tec. Go Outdoors will always offer between 50 - 70% discounts across sale items, this tends to run on a regular basis. What we tend to see are weekly and bi-weekly 10% voucher codes that are usually off tents or certain categories. 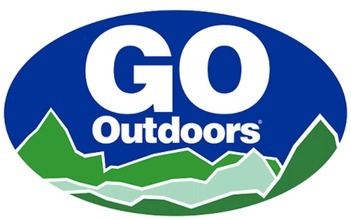 Go Outdoors will offer flat discount codes across all orders but these tend to be less frequent, so if one is active then we advise you look to use it. Does Go Outdoors Offer Student Discount? Unfortunately Go Outdoors do not offer student discount. Instead we recommend that you sign-up to one of their 'Go Outdoors Discount Cards' It will cost you £5 and last 12 month's but will guarantee 10% off the retail prices at Go Outdoors. Got a question to ask Go Outdoors? Then get in touch with their Customer Care team. The current contact details are below. 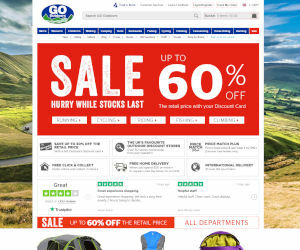 Go Outdoors is one of the biggest camping superstores in the uk. They have taken there huge Instore presence and applied it to their online store. Be sure to checkout the store great bargains and discounts. – Free Click & Collect available on all items. – Sales usually hit heights of 60% on top outdoor brands like Rab and Berghaus.